gldA catalyzes the NAD-dependent oxidation of glycerol to dihydroxyacetone (glycerone). This protein allows microorganisms to utilize glycerol as a source of carbon under anaerobic conditions. In E.coli, an important role of GldA is also likely to regulate the intracellular level of dihydroxyacetone by catalyzing the reverse reaction, i.e. the conversion of dihydroxyacetone into glycerol. gldA possesses a broad substrate specificity, since it is also able to oxidize 1,2-propanediol and to reduce glycolaldehyde, methylglyoxal and hydroxyacetone into ethylene glycol, lactaldehyde and 1,2-propanediol, respectively. 1. Prepare a 200ul reaction mix into a suitable container: The final concentrations are 93mM Glycine, 93mM Potassium chloride, 2375mM Glycerol, 3mM b-NAD. 2. Equilibrate to 25C and monitor at A340nm until the value is constant using a spectrophotometer. 3. 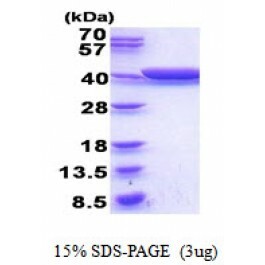 Add 20ul of recombinant gldA protein with various concentrations (0.2ug, 0.1ug, 0.05ug) in 180ul reaction buffer. 4. Mix by inversion and record the decrease at A340nm for 10 minutes. Recombinant E. coli gldA protein, fused to His-tag at N-terminus, was expressed in E.coli and purified by using conventional chromatography techniques. Phosphate buffered saline (pH7.4), 10% glycerol.